Pioneers in the industry, we offer liquid oral manufacturing plant from India. 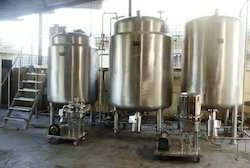 Liquid Oral Manufacturing Plant comprises of sugar syrup vessel, online sugar syrup pre-filter, manufacturing vessel storage vessel, vacuum system for transfer of sugar and sugar syrup, product piping, control panels and transfer pumps. The construction of the complete system is done in a way that allows for plant to be easily handled by single operator, thus saving on man- power costs. Further, the system has the provision for boiler steam and electric heater heating to achieve and maintain the desired temperature.